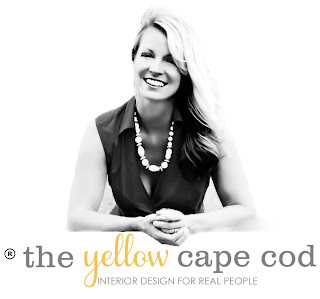 The Yellow Cape Cod: Makeover Reveal - Two Winter Outdoor Living Spaces! 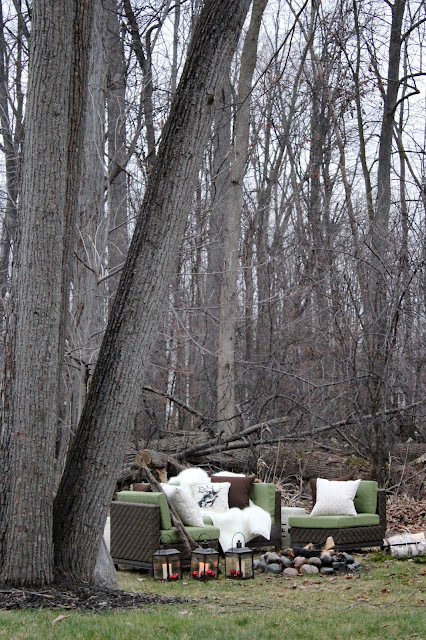 Makeover Reveal - Two Winter Outdoor Living Spaces! I've been wanting a new outdoor furniture set that is large enough for my whole family for a while now and last week my wish came true. I partnered with AE Outdoor and received their Hampton 8 Piece Sectional set for an outdoor living space makeover. The moment it was delivered, I went to town turning our deck into an outdoor holiday hang-out. We may not have snow right now, but it definitely feels like Christmas out here! In anticipation of winter, we packed everything on our deck away that was not suitable for cold weather. It left the space feeling empty and lonely. Now that we have an all weather furniture set, we can take advantage of this space year round. It's already become a favorite family hangout. 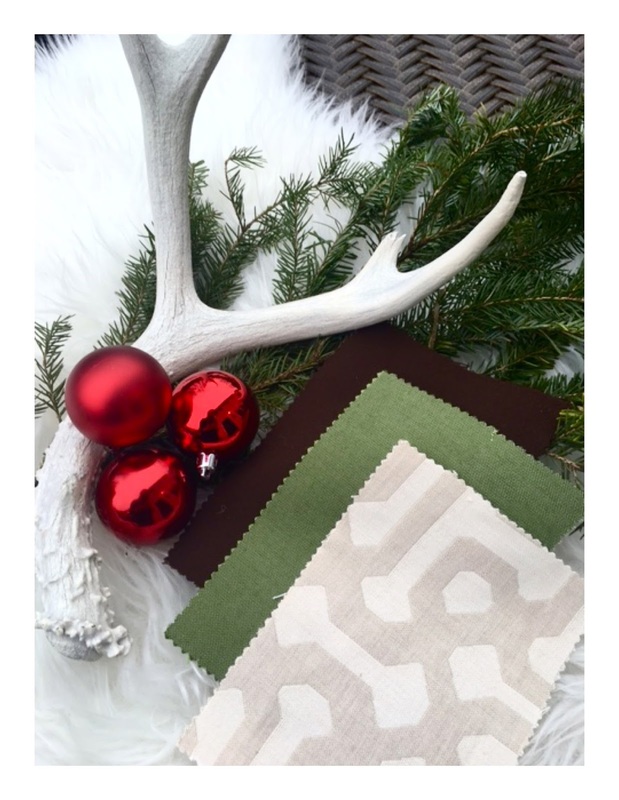 It's hard to believe that these fabrics are intended for all-weather outdoor use. They are so soft and beautiful, this set really brings the same importance of the inside living room to our previously barren and negelected outdoor space. For the holidays, I added fresh cedar garland and white twinkle lights to the railing. I brought out some indoor decor elements to use while we are entertaining. Like a giant fur blanket, red velvet toss pillow and a wool rug. 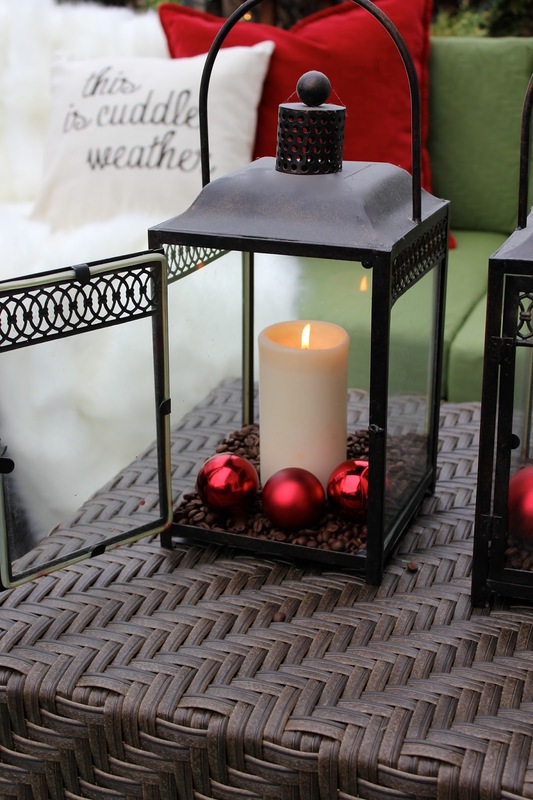 I placed vanilla scented candles inside lanterns, then filled them with coffee beans and a few festive ornaments. When the candles are lit, they warm the beans and the smell is divine. 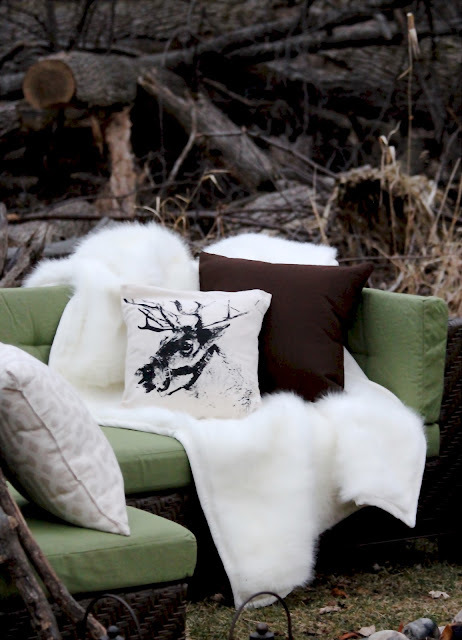 To finish off the wintry look and lend a nod to the surroundings I added a few natural elements such as pine cones, birch logs and antlers. The new furniture set provides plenty of seating for my whole family with some room to spare. There are many different arrangement options. For now, I have it configured as a large sectional sofa with the coffee table in the center and the two small cushioned stools on the side to use as extra seating or end tables. What I love most about this set is how versatile it is. Each piece is completely independent of the others. It's very easy to change up the look and function by reconfiguring the arrangement. As a matter of fact, it's so simple to move these pieces around that we can easily move our family hangout down to the firepit. One cold day after school last week, my daughter and I decided to have a fire. On a whim we grabbed a few sections of the furniture and moved them to the fire pit area and created a romantic, cozy, fireside retreat. 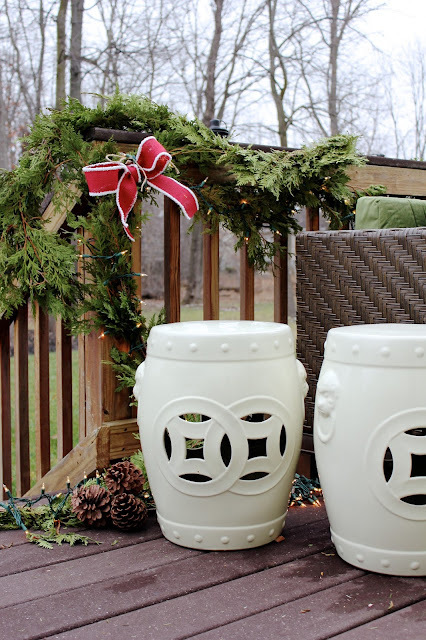 Our Holiday entertaining space just grew by two "rooms" thanks to these two outdoor living space options we have from just one furniture set. As much as I love the way the set looks on our deck, I'm also smitten with the look of the set in the woods. The beautiful green fabric looks gorgeous against the wooded backdrop. And the herringbone patterned wicker construction is the perfect compliment to the natural surroundings of our fire pit area. 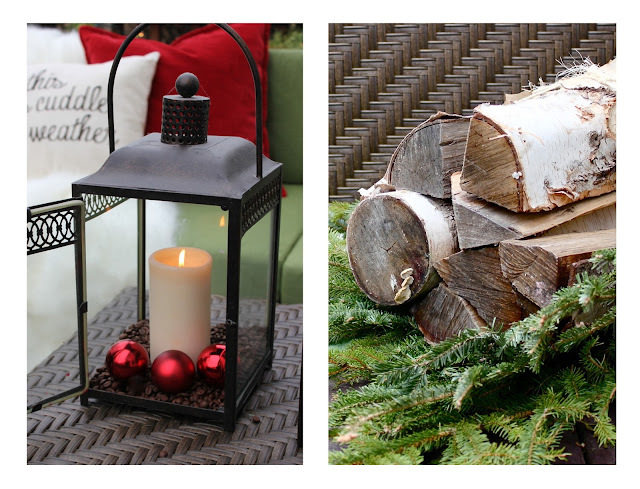 I can see our holiday party happening in two phases, starting on the deck and moving down to the fire pit after dinner for hot cocoa and s'mores. 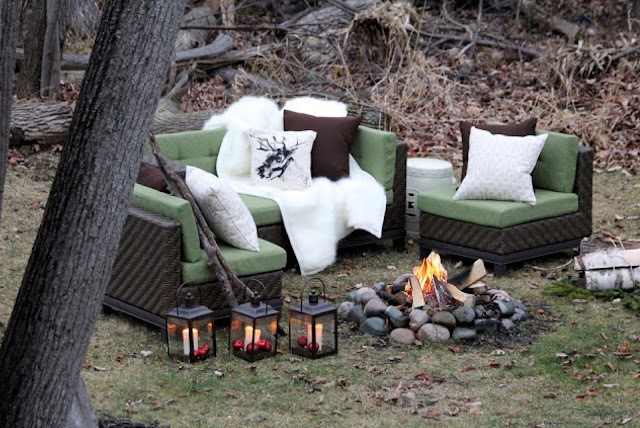 Thanks to AE Outdoor we lots of options for creating a cozy, outdoor living area for our family to enjoy year round. Check out AE Outdoor to see more of the beautiful furniture sets available. For more tips on how to enjoy your outdoor living space, please visit the AE Outdoor Blog. 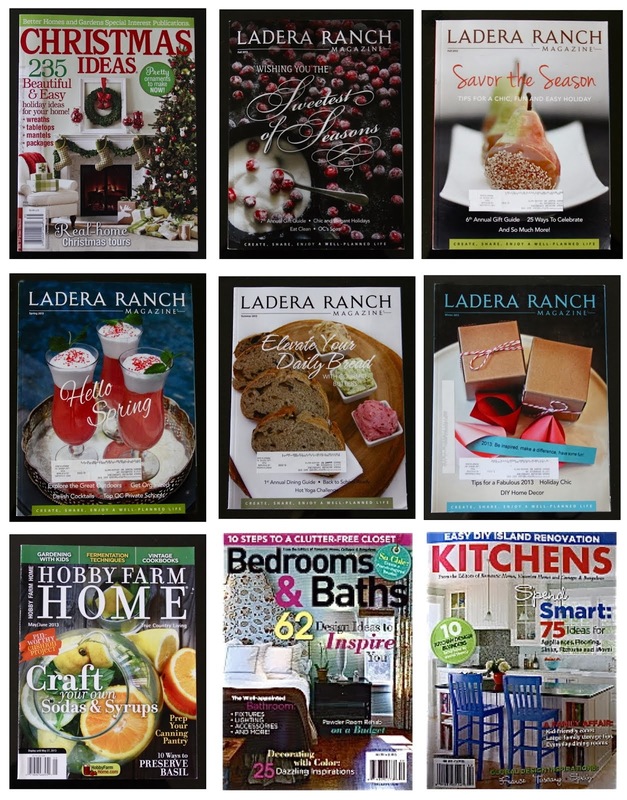 If you missed it, click here to view the rest of our 2015 Christmas home. 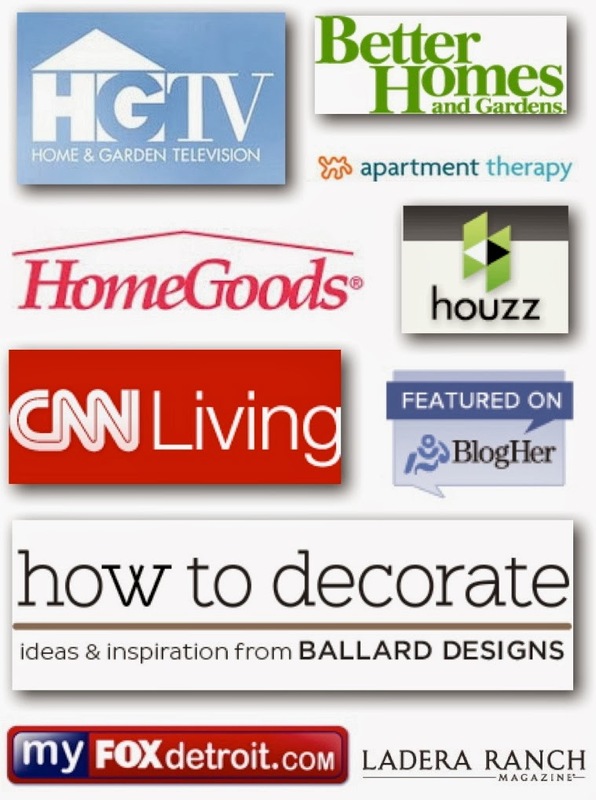 Online Design Services are now available. 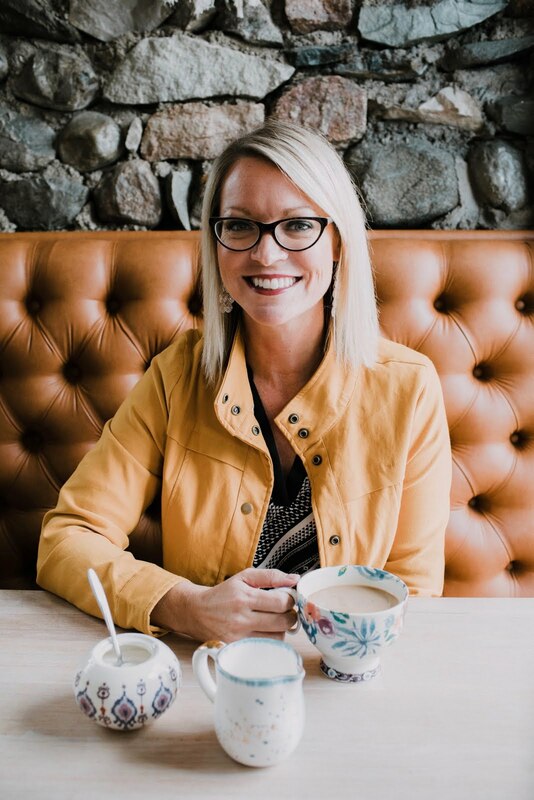 Please click here for details! *AE Outdoor provided me with an outdoor furniture set to facilitate this review post. As always, all opinions are my own. Your outdoor space is amazing and so inviting. I could definitely see sipping some hot chocolate out there while making S'mores. What a fun place to decorate for the holidays. Wow!!! I'm in love with the color & of course you style NEVER disappoints!! I love the fire-pit shots..so cozy & quaint, yet still bold! !